I would like to talk about what is perhaps the coolest genus in the animal kingdom. Nicrophorus. Also known as burying beetles, the more than 60 known species that comprise this genus are a strange and wonderful mix of pure grotesquery and marvelous parenting. You see, they are called burying beetles because they bury dead animals, but their reasons for doing so is what I find to be their most fascinating feature. They do it for their children. You may be wondering what the big deal is. Sure, all kinds of insects bury their young with dead things. In fact, that's how most wasps operate. Look to the picture on your right and you will see the thing that makes these beetles different. 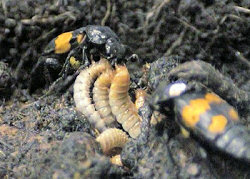 No, you're not hallucinating, that is a mother american burying beetle (Nicrophorus americanus) feeding her young. Notice the father watching from the foreground. This kind of behavior is unheard of in the insect world, at least outside the realm of social insects like bees and ants. Sure, it's gross, but its also kind of beautiful. The amount of effort these beetles put out to raise their young is tremendous. First, they have to fight off all the other beetle parents in a violent free for all. Then the winners spend the next eight hours stripping down their hard won carcass and burying it in a "crypt" lined with the dead animal's feathers or fur. Then the mother lays her eggs. The doting parents will spend the next several days fighting off hungry intruders and coating the meat with chemicals to slow decay and mask the scent that draws in competitors. Not to mention the effort they will put into regurgitating nutrients to their young. There is one other thing though. I warn you, it may push your opinion of these creatures toward the grotesque. They kill some of the young. I know, it seems harsh, but only so many young beetles can grow to maturity off a single carcass. The beetle parent logic is to raise the maximum possible number of strong, healthy babies and no more. Whatever your judgement, gross cannibal or insect super parents, you have to admit that these are some of the most amazing creatures on the planet. I have read that these are near extinct, I just found one in my backyard and looked it up to see what it was. I live in Florida. Nicrophorus americanus is definitely at risk, so its very cool that you found one.